This includes all of the moving parts from your finger to the hammers, and we add pedals works and Player piano action parts via links down this page. If in doubt, please go to the diagram pages and double check to see if you are ordering the right part. It is impossible to give a "Back" button to return to so many pages, so please use your browser's "Back" button. pianoforte recitals, than to sit and have my teeth drilled." George Bernard Shaw, Irish playwright and music critic. 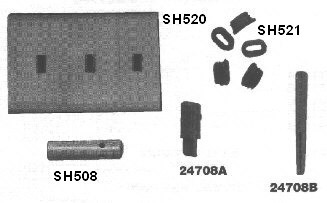 These are parts which may fit in any piano. These are VERY limited in scope.  You will probably NOT see what you need here. depending on your piano, and see if the parts are there. the right repair clip for one, two, or three wires!!!!! a hole and setting a screw. for the tabs and dropping the agraffe into the holes. will not swell in damp weather. Mounted at the far end of the key levers against the sticker. Use to remove lost motion. Damper flange cord-- Used to mount the damper spring in uprights to prevent clicking. Use when any flange is cracked- Fits all common flanges. Also, will keep loose center pins from traveling. Give it a slight inward pinch and a drop of glue before mounting. tuning pin hole, and tuning pin is inserted back into hole to hope pitch. Glue the broken key back together with Elmer's Carpenter's Glue. 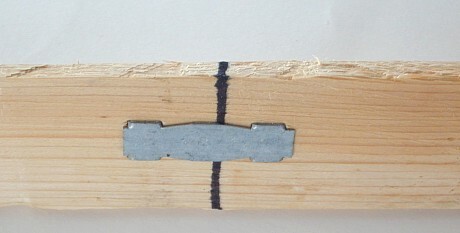 Illustration showing the Scotch Clip applied to wood. the key lever. 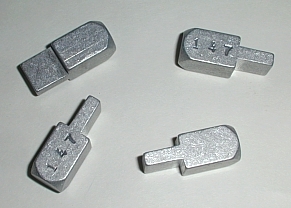 The vise presses the clips in without hammering. Wood glue should be used at the same time for added strength. 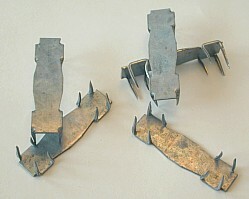 The clips are VERY dangerous for children to play with. We can make a new key lever, but it is not cheap! And, how to repair a jack which has come loose. be the appropriate step to take for your piano. in the hole, or glue it in. These leads can be attached on top of the key lever or under it. wish to sell the piano, they can be removed. It is not smart to only add weights to certain keys. The overall key touch will become uneven and very annoying. you are all rigged up. If Keith is not available, or is out tuning pianos, SEND E-MAIL. We answer all our customers' E-Mail.